Japanese whalers call the enigmatic black whales "karasu," the Japanese word for raven. The new species is darker in color and about two-thirds the size of the more common Baird's beaked whale, but so scarce that even whalers rarely see them. 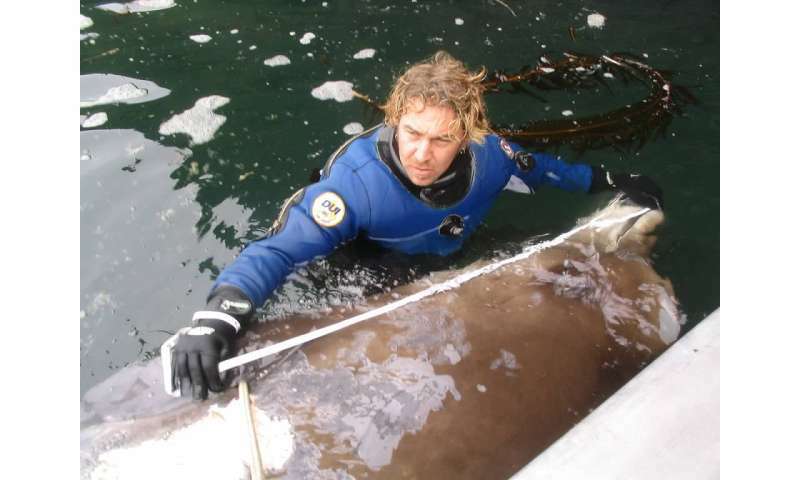 A DNA analysis of 178 beaked whales from around the Pacific Rim found eight known examples of the new species, the scientists reported today in the journal Marine Mammal Science. The eight included specimens from the Smithsonian Institution and Los Angeles County Museum of Natural History, a skeleton on display in an Alaska high school, and another that puzzled researchers trying to identify it when it washed up on an island in the Bering Sea. "The challenge in documenting the species was simply locating enough specimens to provide convincing evidence," said Phillip Morin, a research molecular biologist at NOAA Fisheries' Southwest Fisheries Science Center, and lead author of the new study. "Clearly this species is very rare, and reminds us how much we have to learn about the ocean and even some of its largest inhabitants." An earlier Japanese study had suggested that the black whales, sometimes considered a dwarf form of Baird's beaked whale, might represent a new species. That sent Morin in search of additional genetic samples to definitively answer the question and better understand the range of the elusive species. He turned first to the Southwest Fisheries Science Center's marine mammal tissue collection, the largest in the world, and found two samples that appeared to represent a new species. 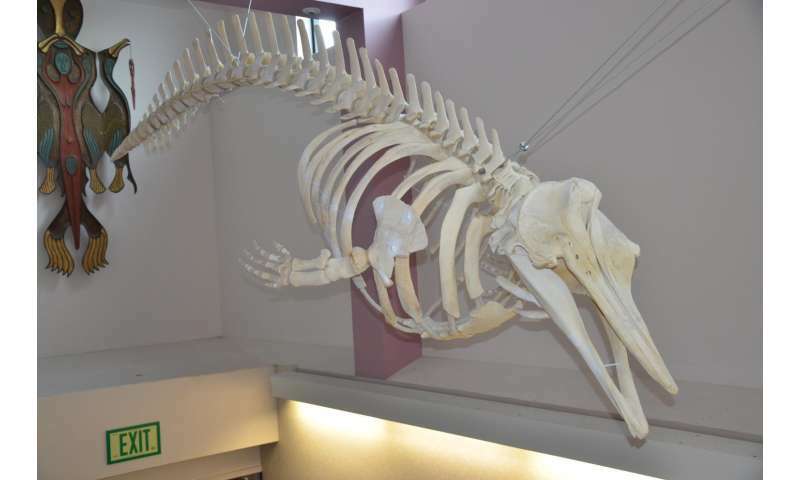 One came from a whale found in Alaska's Aleutian Islands in 2004, whose skeleton now hangs on display at Unalaska High School. Then he and his colleagues pursued additional DNA samples from museums, research institutions and Japanese markets where whale meat is sold. In 2014 scientists found a dead beaked whale on St. George Island, one of the Pribilof Islands in the Bering Sea. When it did not match any known species, they sent samples to Morin. Genetic tests later showed it to be the new species. "We knew it was not any whale we knew from our area," said Michelle Ridgway, a marine ecologist with Oceanus Alaska who documented the whale in the Pribilofs and is a coauthor of the new research. DNA analysis shows that the new species and Baird's beaked whale are each more closely related to Arnoux's beaked whale from the Southern Hemisphere than they are to each other. The genetic differences and smaller size indicate that the black whale is distinctive enough to represent a new species, the scientists found. Official recognition and naming of the species awaits a formal review of the animal's characteristics and differences from other beaked whales. Beaked whales remain among the least known whales in the ocean, with several species identified only in the past few decades. They have beaks like dolphins, diving thousands of feet into deep underwater canyons and basins to feed on squid and bottom fish. Japan hunts Baird's beaked whales, the largest of the beaked whales at about 35 feet long. "Japanese whalers have known about the black form but didn't consider it a separate species," said Erich Hoyt, a research fellow with Whale and Dolphin Conservation in the United Kingdom and co-director of the Russian Cetacean Habitat Project. He is a coauthor of the new research, and his research group contributed genetic samples from beaked whales in the Russian Far East. "The implication of a new species of beaked whale is that we need to reconsider management of both species to be sure they're sufficiently protected, considering how rare the new one appears to be," Hoyt said. "Discovering a new species of whale in 2016 is exciting but it also reveals how little we know and how much more work we have to do to truly understand these species." The eight known examples of the new species cluster around northern Japan and the Aleutian Islands and Bering Sea. That suggests that the species has a smaller range than Baird's beaked whale, which occurs throughout the North Pacific from Japan to Baja California. Scars from the cookie-cutter-like bites of tropical sharks suggest that, like other beaked whales, the species may migrate to tropical waters. "As much as we know about the genetic heritage of this animal, we still do not know very much about the animal itself," Morin said. "We can draw some indications from what we know about other beaked whales in terms of its range and behavior, but we still have many more questions than answers."